Heaven help us! We’ve got to teach the kids things that start with h. Heaven has answered! 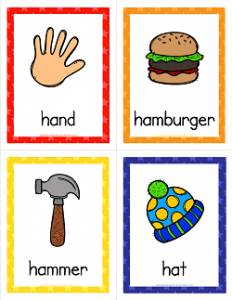 Here are some beautifully created cards with words starting with h. The words on these cards are hand, hamburger, hammer, hat, heart, hive, hook and house. Those are some pretty good words. I think your kids will like them, too. And they’ll like making the h sound. It’s like making small little breaths. Please enjoy these and have fun!